If you have the opportunity to visit Norwich in Chenango County, New York, be sure to visit the fantastic Otis A. Thompson Local History Room at the Guernsey Memorial Library. 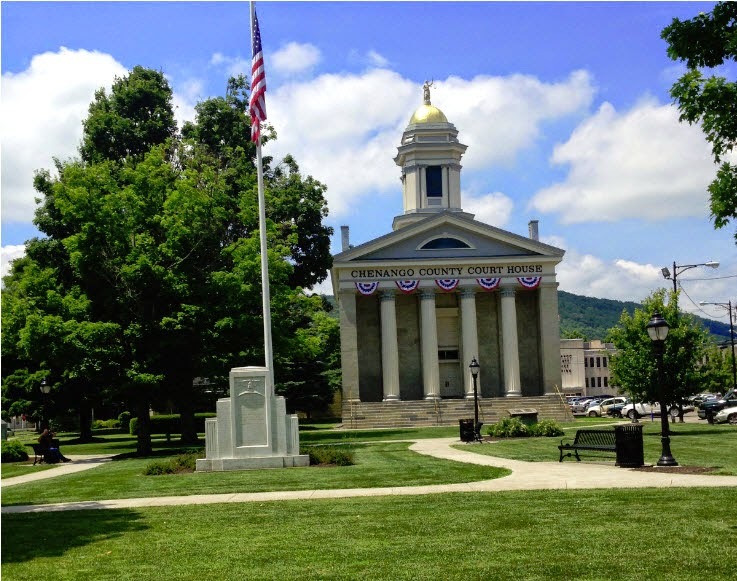 The library is located on 3 Court Street behind the impressive Chenango County Courthouse. Be sure to check the hours before you go. There are options for people who can’t visit the library, so be sure to read the rest of this article if that applies to you. This is a serious library. When you arrive you will be asked to read and sign a User Agreement and produce government-issued photo identification. Cell phones, of course, need to be turned off. Although there were hundreds of history/genealogy books and rolls of microfilm, the best feature in my opinion is the collection of family folders. You write down the surnames you are researching and the librarian retrieves the files for you. Each file is composed of a fascinating variety of letters, e-mails, hand written notes, copies of relevant pages from assorted books, pedigree charts, family group sheets and more. People who cannot visit the library can write to the Guernsey Memorial Library with their research questions, and the librarians will look through the library holdings and send you a response. A record of this correspondence is then placed in the appropriate surname file. I am researching numerous surnames in the Central New York area. I requested the files on Spaulding, Crandall, Hiscox, Burdick, Hall, Dewey and Cutler. Well, I was flabbergasted. The first file I looked at was regarding the Crandall surname. Many of the researchers were exploring the same lines I am working on. The beauty of these files is the letters and e-mails sent in by researchers contain details that you might never find on the Internet or in books. You have to be careful not to rely on the information without corroborating it, but the information gives you wonderful clues for further research. "Library Addresses for Genealogy Material"
"Formation of the Counties in New York"
"Chenango County Boundary and Town Changes 1798-1975"
If you wish to write to the Otis A. Thompson Local History Room, click here. You can do your request online or by mail. If you send a request via mail, please remember to send a SASE. The day went by very quickly, and I was sad to leave. I really need to plan another trip to New York.